Buying gifts for man can often be quite a hit-or-miss gamble. Many is the fellow whose closet has contained numerous ties and sweaters he kindly thanked his wife for, wore once in the hope that it would make her happy, then retired to a clothes hanger for the rest of his natural life. When gift-giving adventures forth into the realm of pipes and pipe tobacco, things only get more complicated - even a fellow pipeman can be overwhelmed with trying to come up with the right gift, faced with all the innumerable particulars of various smoking blends, cuts, the graining of briar, details of shaping, stem material or color, etcetera and so forth interminable. So, in the end, what is best to give a man who will, as like as not, smile and nod and thank sincerely you for the sentiment, even if you completely missed the mark (thus further confounding any future attempts to really get the right gift, in a potentially ever-descending spiral of misread impressions)? Well, one answer might to give up and stop trying to show your appreciation or affection for the insufferably courteous fellow at all. A better answer, however, would be to give him the chance to by his own d#$*ed gift. 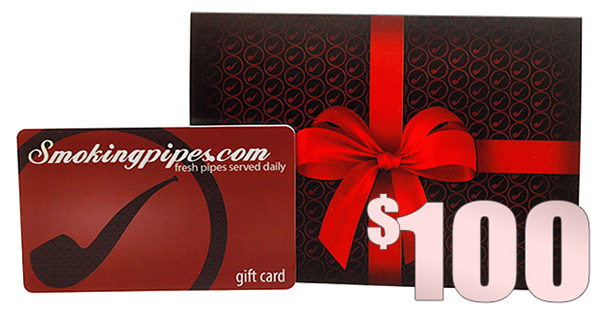 And that's just the opportunity we're giving you, with Smokingpipes gift cards, conveniently offered in a value range that will cover everything from "stocking stuffer" to "I'm sorry I accidentally set your car on fire." (Or alternatively, "You're really going to owe me when my birthday comes around." Due to various factors on our end, please note that these gift cards will be shipped separately from any regular items within the same order and will arrive in their own envelope. All cards are without expiration date, nor does the balance on any card need be spent all at once. What can I say it's the gift of awesomeness. Who wouldn't love 100 off a pipe or a ton of tobacco. A crazy person that's who.